It also highlights a disconnect between the PBS training I have undertaken and that I deliver and the viability of expecting teachers to have the requisite time to complete the in depth analyses of each child needed to produce the most effective support strategies. Fear not – I think there is a way to develop this and it relies on two things. The culture of the school and the relationship the teacher (or carer, or parent) has with the child. This post will outline the role relationships play in behaviour support, I will also outline some of the research led practices I have used. Before I start I do want to say that I have read studies I do not agree with. I also know that a huge number of studies conducted ON Autistic children/adults focus on strategies intended to normalise social behaviours which is a huge ethical issue. Fortunately I have had the opportunity to listen to and discuss elements of my practice with actually Autistic academics and practitioners. This has greatly shaped my approach and ethos towards behaviour support, I will also admit this has slanted my view of a lot of studies that remove the human element from behaviour and reduce the children to purely objects to study. To this end I fully expect some of the approaches in the post and the presentation to be a bit controversial and I am 100% sure that at least some of them will contravene your school (or center’s) behaviour policy. First of all here is some research that shows Autism does not cause or need to lead to “Challenging behaviours”. In special schools I think we can be prone to over analysing natural human reactions to situations. We work with a population of incredibly vulnerable children, we are often attuned to their every move, they are usually monitored throughout their waking hours. Usually within meters of an adult. Lying, cheating, and duplicity are almost completely unheard of in my setting the children are honest, rarely judge others and rarely bully peers. Yet every facet of their day is planned controlled and assessed, choice is real but limited. They do not have the guile or opportunity to hide what are often natural teenage/childish actions. Imagine how you would feel if you just wanted some time alone, you don’t communicate the same as those around you, and they have yet to learn your language so logically you push people away. This just results in more people appearing. Sometimes you are even taken out to “calm down”, this of course is what you were asking for but everyone seems cross about it. What have those interactions taught you? Maybe that standing at the door doesn’t work, that pulling someones arm doesn’t work, that exchanging a garden symbol doesn’t work but when you got frustrated, panicked and lashed out you immediately got what you needed. Now which action are you going to use next time, the ones that didn’t work or the one that did? I try to use the word “action” rather than “behaviour” following a discussion with Damian Milton. Using behaviour has negative connotations and actually what we often mean is a learned response to interactions or an attempt to communicate. After all we all display actions that are not conducive to certain situations. 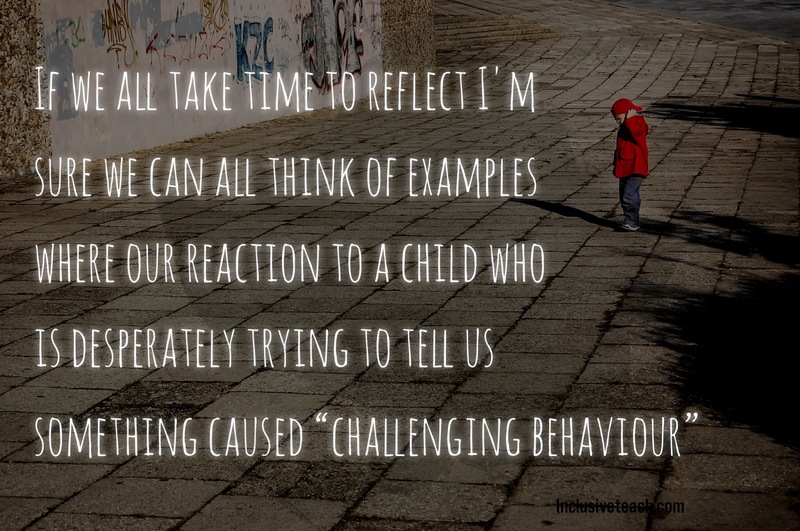 If we all take time to reflect honestly on our practice I’m sure we can all think of examples where it was our reactions to a child who is desperately trying to tell us something that caused the actions to be interpreted as challenging behaviour. We are humans too and destined to make errors despite training and experience. We can no more leave all our emotions, baggage and worries at the door than the child can. What we should strive for is to control our responses, plan them, and acknowledge when we mess up. Say sorry if appropriate. School culture is essential here, are you as a teacher supported when things go wrong? Are you given the training and skills you need to in turn support the students who need you the most? If you are not and still go out of your way to achieve this yourself you are a saint and need to drive the change into a school that deserves you. You should at a minimum have the power to control the culture of your classroom. We have a lot of power and control over those we teach. The balance is almost totally stacked against the children we work with. Therefore your frustrations must never negatively impact the education of a vulnerable child. The unhelpful SEN Deficit model. If we as teachers follow this deficit model approach to Autism and indeed all students with a diagnosis of SEN then I think we just end up looking for problems and focusing on the “Challenging Behaviour”. The first step we need to take is to find our the strengths of the children we work with. The school I work in supports children who have usually had their previous placements fail. When a child is referred to us it is rare for any conversation to start with what they can do, what they want to achieve and what their hopes or dreams are. To be successful with a child you have to display relentless positivity – from the start. The training I lead is a Positive Behaviour Support model that is heavily derived from applied behaviour analysis (ABA) and more recently the work of Gary LaVigna. This centres more around non-aversive behaviour support. There are plenty of studies supporting the effectiveness of pure ABA and likewise plenty of research that suggests the negative and aversive side to ABA practices; particularly from those who have experienced it applied to them – in my opinion the group whose voice should be heard the loudest. It is rare to see pure ABA practiced in the UK but elements are used throughout the education and care system. Often and increasingly controversially it is seen as a treatment for Autism. I would recommend reading around this discussion as it will shape the way education and services for Autistic people are approached in future. I cannot recall where I heard the term Anecdata but it perfectly sums up what many of us have to rely on. Before I started trying to find out more about PBS and the science behind it I used to sit in meetings telling stories and giving guesses as to what was happening. This really doesn’t cut it when you are talking about the future quality of live for a child. Your input and knowledge of what is going on may make the difference in securing the right support for a family, the right education placement or even how much additional specialist input a child receives. With ever increasing pressure on schools and social care the more confidence we have in what we are saying the more robust our evidence base the better the outcome for the child. Many special schools will use many of the data collection methods used in ABA to provide us with insights into the actions of our students. All of these are “proven” in numerous studies but are limited and we will never use them to state facts just as a way to back up our thoughts and guide possible strategies we can use to support the child. One of the ways to try and work out the function of the child’s actions is by using a Questions about behaviour function sheet. The QABF can give us a clue as to whether the child wants something (attention or tangible), wants to get away from something (escape) or is using their behaviour to tell us that something is wrong internally (physical). If the behaviour acts as a stim (non-social or self stimulation) then I would never try to adapt or suppress it unless severe harm is being caused. Of course it is subjective and our opinions can sway the results. S.T.A.R charts are a common way of analysing the actions of a child. They can help when we want to look at how our response supports learned behaviour and can lead to ways we can support the unlearning of dangerous behaviour. I like the way the S.T.A.R approach acknowledges the complex nature of behaviour, how it can be used for multiple reasons. However I do think it is easy to get it wrong unless we are honest about our part in the interaction that leads to challenging behaviour. What this really means is we can test ideas. If they are trying to escape is it from a peer or adult that they don’t like? Is it from work that is too hard? If it is physical is it hunger, pain? Always start with the assumption that the child is trying to find safety if they are running they are probably running to somewhere, to hide, to feel safe. Can we create that for them? Work by Halpern (2014 Not SEN focused) looked at the effects of having little control over the territory we see as ours as having a negative impact on mental health. How many classrooms create spaces for all our students? Is this practicable? Please let me know, an excellent idea for a school based research project. I have managed three distinct zones that the students can use to gain space but these are not “theirs”. All of which should lead us to the fact we need to teach the child a better way to communicate – a way that is safe and transferable. This may take a lot of time and effort for both parties. All this requires a systematic approach that is not that hard to achieve but takes time, some training and the desire to investigate – and I believe we owe it to our children to do this not immediately label the actions as challenging. It is also important that we learn to differentiate between times a child is so overwhelmed they cannot control their “meltdown” and when they are just having a grump. So what does this mean? Nothing without a good relationship between the child and the support staff. I work with a team of people who are willing to put the time in to get to know the child and interpret their actions so communication skills are taught in a supportive environment. Importantly this takes place in an environment in which the child feels safe – and this takes hard work to create and maintain. The graphic below outlines some key elements we should be building into our schools to make them a better place to be. I think you need a team around the child of people who are into the science, the data, the analysis. You also need those who are creative, who can solve problems with great ideas that draw on their knowledge of the individual to ensure they can actually use these skills. Everyone on the team needs flexibility care and trust. Most importantly everyone needs to agree on an outcome and a plan – what we really want to do then is involve the child. What do you want, how can we help? One way of doing this is when an incident occurs do not ask what can we do to stop them displaying this behaviour but “What are you trying to tell us?” and don’t assume that just because a child has speech that they can formulate the words they need to say what’s wrong. Especially in the moment when everything is going wrong for them. Work by Robledo and Donnellan (2016) into supportive relationships suggested that people will test those close to them as a way to ensure they can be trusted to act in the persons best interest even when tested to their limits. I have seen this for myself and heard anecdotes about children displaying behaviours towards those they feel closest to. This research helps show its not just an assumption. So what can we take away that will help us form strong supportive relationships? This study by Sweeney et al (2014) was set not in schools but in acute hospital wards (comparisons can be drawn, I have been in both) but found that staff who displayed warmth and showed a real interest had a positive impact on the wellbeing of the people they worked with. This is turn showed a reduction in the amount of negative interactions that occurred. Children know when they are liked and who is genuinely interested in them. You cannot be effective in supporting a child without investing time in the relationship. As you build a relationship you will find things out, clues, as to why the child needs to use certain actions to meet a need. Thinking back to the STAR charts. The S is setting conditions. Things that affect the child, often out of your control but which have a huge bearing on their lives. These may be a mystery. Especially traumatic events in their past. Do not underestimate the impact of Trauma on a person. Worthington (2012 should be free to CCCU students) states the impact of trauma on a person’s behaviour and their ability to communicate effectively prior to displaying aggression. For students with SEN sudden changes can be high impact events. A family breakdown, witnessing or being the target of aggression at home or school will all at least have a negative impact on their sense of security and represents a loss of consistency and safety. Reality – Your Own Research is Valid. Leo Kanner’s original study into Autism in 1943 consisted of… 11 people. You can do research that is valid to your children and your school, you will be able to easily identify the limitations and even recheck the results. when you do this I guarantee that you will be able to identify the areas where your relationships, your mood and nuances of your approach had an impact on the outcome. We should also consider the ethics of intervening without analysis. Even just an anlaysis of your data can provide clues to make life better for the children. This trend I identified relating to temperature and behaviour might look simple and obvious but can lead to real differences for the children we work with. The reality is in a school setting you face a hundred pressures a scientific study doesn’t. Differing skill levels, experience levels, backgrounds, expectations of progress evidencing all sorts of things, observations by people that may not share your interpretation of the situation. You must find a way that works for you and your children. Don’t fall down a rabbit pit of research studies – I have about 60 I should have included here. If you take one thing away invest your time building trust with the children. This will deescalate situations more effectively than anything, it will prevent more “challenging behaviour” than you will even realise. Accept some days things just go wrong. Phoebe Caldwell – the Anger Box. Previous The Ultimate Guide to Transitions. Next Essential Books for Inclusive Teachers: Behaviour.